Video: How does the cloud make you agile? One of the most commonly touted benefits of the cloud is that it makes you agile. But what does this actually mean? In this video, we'll find out what it means to be agile and how the cloud helps your business to innovate faster then capture opportunities. Hello everyone. How does the cloud make you agile and what is agility? Agility is this soft benefit that people talk about when you move to the cloud. That’s really not intuitive to understand and it’s hard to put your finger on. 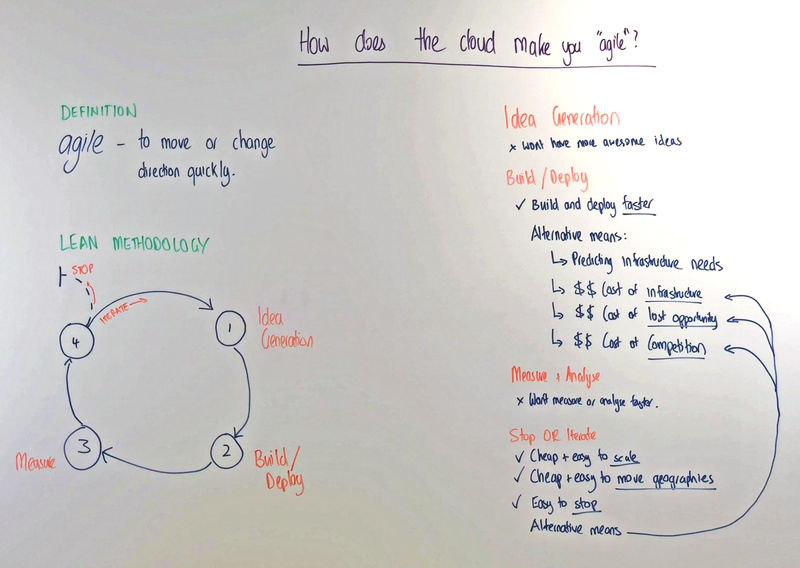 So today I’m going to make an attempt to explain to you the concept and help you understand what the benefits are in terms of moving to the cloud. So agility is to move quickly and easily, and in this concept, I’m going to introduce the Lean Methodology. So, the Lean Methodology is a process that the very best organisations in the world use – and let me take you through how it works now. So step one; we come up with a bunch of ideas we decide on one or more. Step two; we build out those ideas, we procure some infrastructure build out the software [and] we take it to market and hopefully it works. Step three; we measure and use the results that we get from those that build and software in the market to see how we might need to adjust. And then finally (step four) we need to make a decision; do we stop? Is the idea flawed? Or, do we continue and perhaps innovate on our idea and follow the circle around? So how does that relate in terms of the cloud and how might you get benefits from that? In Idea Generation, nothing really changes; you’re not going to produce any more ideas in any faster time by using the cloud, so things are the same. But once we move beyond this – we move to the Build and implementation phase – there are huge benefits. So let’s have a look. Traditionally this is how it might work for you. You start out you’ve got an idea. Now, you know that you need to get some resources, so you need to buy some server infrastructure. How much do you need? How much storage do you need? How fast should the engine be? You get together with your peers, you make an educated guess and then you go and try and find funding. Who’s going to come up with the money for that infrastructure? Now once you’ve found the funding which is great – everybody is happy – now we’ve got to go to HP or the Lenovo or Dell and we go through procurement phase, so two weeks, four weeks, six weeks. In the meantime, your competitors doing the same thing, but they went to Amazon Web Services. They decided to use the cloud. So, you’re going through your thinking and planning stage and your competitor has just turned on their server. They’ve deployed it, they’re starting to build their software and there’s already a gap between the two of you. You’ve yet to even order the hardware. So if we follow this process through; you work out what you want, you get your funding you’re about six weeks in, your competitors here (up) and you’re here (down) you’re going in opposite directions. That’s not where you want to be. So by leveraging the cloud what we’re not doing is losing out on the opportunity and we’re not putting ourselves behind the competition, which is where you end up when you’re going through the traditional route and you’re competitors have already built their product. If we take and follow that through we went from idea to build and now we come across to Measure and Analyse. So what we want to do here is use the information we collected during our build phase in our go to market phase and try and gain some insight and measure what happened. What was successful? What worked and what didn’t work? Again now in the traditional way, you might need to go and procure some more hardware and find some more money – okay – and it’s not looking good for you. In the meantime, your competitors turned on a data lake in Amazon Web Services and they’ve done their analysis in two hours. So the discrepancy between you and them is quite large. So, in the cloud, we can scale out so that we can handle that scale really, really quickly and not only can we scale out, we can handle it when we’ve got people from Germany or Russia, the US or Australia – all over the world. It’s simple it’s relatively straightforward. And that’s that’s dealing with scaling quickly, and that’s dealing with multiple geographies where your customers might come from. Okay. And we can go left and right we can go up and down really quickly. So we’re left with this big discrepancy. This is you and this is your competitor and that’s the difference between agility and how it helps you and your business if you use the cloud services. Learn how to innovate faster, increase productivity and bolster security. Enter your email and we'll regularly send you the same insights we give to our clients.